The Illinois Policy Institute is composed of a team of truth tellers. Sometimes, telling people the truth hurts and is thus unwelcome. But only by facing the truth can we fully understand root causes and fashion solutions that actually work. We are not alone in telling the truth. Newspapers, TV news, talk radio, other policy organizations and some elected officials, though all too few, all periodically tell the truth. But what sets the Illinois Policy Institute apart is that we don’t just tell the truth about what is wrong; we offer concrete solutions that will actually solve the state’s problems. But we don’t stop after we have offered solutions. In 2013, our policy team, led by Vice President of Policy Ted Dabrowski, offered the only pension reform proposal that actually ends the state’s pension crisis. The Illinois Policy Institute has also led the fight against a progressive income tax and is providing the public with the truth about how ObamaCare affects their lives. And our truth telling is catching on. We have the largest, and more importantly, most impactful team of advocates working to promote liberty-based ideas tolegislators of any watchdog or research group in the state. This team, led by Senior Director of Government Affairs Matt Paprocki, has been chalking up wins even in what is presently a blue state. Read more about our government affairs team’swork in 2013 on page 24. We have the top-ranked digital team in the country among policy organizations. Do you know how many Twitter followers we have? Go to page 23 to find out, and learn more about why digital is so important. This year more than ever, people occasionally recognized me on the street. I blame our media relations team, which kept securing high-volume and high-quality media placements throughout 2013 all over the state and the country. Go to page 21 to learn more about why earned media is so important to our work. Back in my sales management days, a new manager on my team said, “John, you always say we are in the people business, but you spend so much time looking at numbers. Why?” I replied, “Numbers tell stories about people.” Turn to page 28 to see what Vice President of External Relations Jonathan Greenberg has to say about our 2013 numbers and the stories they tell about the people of Illinois. 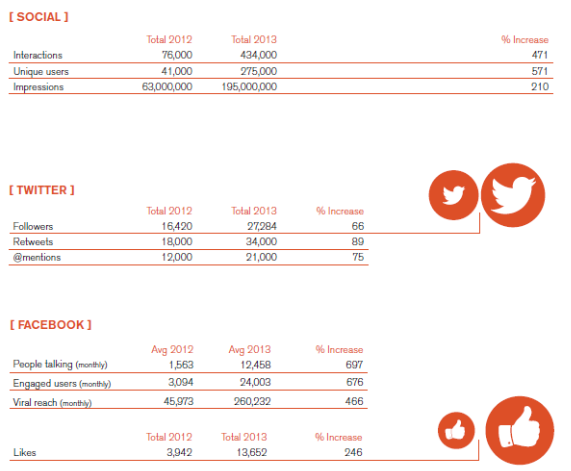 output in the media and beyond – for we expect to have an even bigger impact in 2014. P.S. The Illinois Policy Institute is gearing up for the policy showdowns coming up in 2014, including the continued struggle over pensions, fighting a push for a progressive income tax hike and more. To get a sneak peak at what we’ll be focusing on in the coming year, check out Executive Vice President Kristina Rasmussen’s article on page 31, which outlines our plans. The Illinois Policy Institute constantly tracks the pulse of Illinois’ political ecosystem. Some of the biggest issues in 2013 included the ongoing pension reform and budget debates, and fighting back against the progressive tax push and ObamaCare. The Illinois Policy Institute was the first organization to propose a detailed 401(k) pension solution for Illinois that would put workers in control of their retirements and get government out of the pension business. A year ago, we were told that 401(k)s would never become part of the conversation. In January 2013, the government’s own number crunchers scored our 401(k) pension plan. In February 2013, our plan was turned into legislation and sponsored by liberty-minded leaders, including state Reps. Jeanne Ives and Tom Morrison. And the Institute stood virtually alone among policy groups in opposition to fake pension reform during a last-minute special session in December 2013. Led by Vice President of Policy Ted Dabrowski, we forced legislators to justify their positions, walked several editorial boards through the proposed legislation and were the go-to leaders of the intellectual opposition. Our pension reform plan is part of our overall plan to save Illinois: Budget Solutions 2014, which prescribes responsible spending solutions for state and local government. These solutions include: returning $7 billion to taxpayers by repealing the 2011 income tax hike and implementing spending reforms; paying down the state’s $9.3 billion in unpaid bills by 2016; and improving health care and education to ensure the state’s neediest residents receive the support they deserve. State lawmakers sponsored 12 bills in 2013 inspired by this package of reforms, including a responsible spending limit tied to inflation plus population. Throughout 2013, we taught the public how a progressive tax would negatively affect families in Illinois. We uncovered this push as not just a tax hike on the rich, but also a tax hike on Illinois’ middle and working classes. We got out ahead of the issue and became the leading source for information on the progressive income tax among legislators, grass-roots activists and media. Led by Senior Budget and Tax Policy Analyst Ben VanMetre, we laid the intellectual groundwork necessary, and used media and marketing strategies to frame the debate from the taxpayer perspective. Without our truth telling on this issue, there likely would be widespread support for the idea of a progressive tax hike. Our work made this proposal’s toxic effect on taxpayers part of the mainstream conversation. And our fight against the progressive tax hike has garnered support in the Illinois General Assembly. In April, state Rep. David McSweeney announced that he and state Reps. David Harris, Joe Sosnowski and Ron Sandack proposed House Resolution 241, which opposes a progressive income tax in Illinois. Accounting for each House Republican and state Rep. Jack Franks, a Marengo, Democrat, 65 lawmakers publicly oppose the progressive tax. That’s one more than the total necessary to prevent the passage of a constitutional amendment authorizing a progressive tax. In short, as it currently stands, the resolution in the House would successfully prevent a progressive tax in Illinois. Illinois faces monumental challenges in health care stemming from ObamaCare. To this end, we focused on blocking bad legislation in 2013. The Illinois Policy Institute provided critical research and information on why a state-funded ObamaCare exchange would be bad for Illinois, and lawmakers successfully blocked an exchange from being established. Though lawmakers voted to expand the state’s broken Medicaid program, not a single Republican in the House or Senate voted in favor of the expansion. We relentlessly educated the public and media about how ObamaCare is increasing health care costs for Illinois families and undermining access to needed care. Throughout 2013, Director of Health Policy Naomi Lopez Bauman and Senior Fellow for Health Policy Jonathan Ingram tracked the ways ObamaCare is limiting access to physicians and other providers, such as hospitals, and laid the groundwork for long-term, market-based solutions to the problems of health care access and affordability. And we have continued fighting to protect taxpayers and the state’s most vulnerable populations by working to ensure that Medicaid eligibility is verified – and done so in a timely manner. * In addition to the biggest issues the Illinois Policy Institute worked on in 2013, the following are a handful of additional issues we covered. To learn more about all of the work we do on budget and tax, good government, health care, jobs and growth, and education, visit illinoispolicy.org. The Illinois Policy Institute made the case for school choice not just through research and outreach, but by telling stories: we produced three videos that told the story of how families in Wisconsin and Indiana have benefited from the school choice options in their states. We also showed how the status quo is failing students in Chicago’s worst schools through Director of Education Reform Josh Dwyer’s “Trapped in Chicago’s worst schools” report, which highlighted how Chicago’s lowestperforming schools are failing students. When we told the truth about how hard families in Chicago have to fight just to get their children a good education, media listened. Through a Chicago Tribune editorial, Director of Media Relations Diana Rickert told the story of Jailyn Baker, a high school student from Chicago’s South Side, who travels three hours each day to get to a Catholic school that offers better outcomes than the public high school in her neighborhood. Many union bosses are failing their rank-and-file workers, and we exposed this truth while continuing to champion worker freedom and choice in 2013. Director of Labor Policy Paul Kersey reached out directly to public school teachers to let them know about their rights when it comes to paying union dues. Through an amicus brief filed in the case Harris v. Quinn, the Liberty Justice Center of the Illinois Policy Institute is fighting back against the state of Illinois’ forced unionization of home-care workers. We also published “The Labor Book,” a comprehensive review of Illinois unions, and continued to be the leading voice for Right-to-Work legislation that would give workers the freedom to choose whether to join a union. In 2013, we expanded our good government work to address online transparency at the local government level, where failure to comply with state law is often overlooked. The Illinois Policy Institute conducted an audit of Illinois’ 102 counties to see how well local officials are doing when it comes to online transparency. We then scored each county based on our 10-Point Transparency Checklist, and discovered that most counties were failing their residents when it comes to online transparency. Our director of government reform, Brian Costin, worked directly with many local officials after the audit, resulting in numerous improvements in online transparency for local taxpayers. Without real entrepreneurs adding jobs to the economy and value to consumers’ lives, Illinois wouldn’t stand a chance. That’s why in 2013, we launched the “Betting on Illinois” series, which chronicles the stories of the entrepreneurs who are making Illinois great again. This series highlights the passion that Illinois entrepreneurs possess, the importance of competition and the tension between burdensome government regulations and entrepreneurial growth. Now in its third year of operation, the Liberty Justice Center is continuing to further our mission of taking the defense of liberty to the courts and beyond. In 2013, the Liberty Justice Center had two important victories: one in Bloomington, which granted an entrepreneur the right to pursue her vehicle-for-hire business; and another in Macomb, which ensured that the winner in an alderman race was rightfully seated. More than two years after she applied to the city of Bloomington for a license to operate a van service, former Marine Julie Crowe was allowed to start her business and exercise her right to earn a living. In August 2013, Judge Rebecca Foley of the McLean County Circuit Court struck down a provision of Bloomington’s vehicle-for-hire ordinance that allowed the city to keep newcomers such as Crowe out of the market to protect established companies from competition. In February 2013, the city of Macomb held elections for several city offices, including the 2nd Ward alderman seat. Steven Wailand, a 20-year-old Western Illinois University student was a candidate in that race and faced Kay Hill, an incumbent alderman who was appointed by Macomb’s mayor. Wailand received 17 of the 33 votes cast in that election – which was 51.52 percent of the vote. However, city and county officials refused to declare Wailand the winner of the election, claiming that a majority required a majority plus one vote even though that alternative definition was nowhere to be found in municipal or state documents. Thanks to an April Liberty Justice Center victory, Wailand was seated as 2nd Ward alderman in the city of Macomb after a McDonough County judge ruled in his favor. For more information, visit us at libertyjusticecenter.org. Illinois News Network is an independent news organization dedicated to promoting transparency and accountability in government, and uncovering waste, fraud and abuse. More than 80 newspapers rely on INN for its top-notch reporting. Each week it provides commentary and investigations, as well as a political newsletter called the Reeder Report distributed to “movers and shakers” across the state. INN is led by Scott Reeder, a journalist with more 25 years of reporting experience and a passion for statehouse journalism. To learn more, visit us at ilnews.org. Rigorous policy research is only one part of the puzzle when it comes to how we help tell truths in Illinois. Another important part of this puzzle is how we package and communicate this research and data. That is where the Illinois Policy Institute’s talented marketing and communications team comes in. The marketing and communications team is passionate about packaging and sharing the rigorous policy research with a number of unique audiences. Our role is to engage with members of the community and provide a valuable service to various audiences, including members of the press and various stakeholders. One of the most effective ways to spread the Illinois Policy Institute’s message of freedom and fairness is through newspapers, TV, radio and online news outlets. 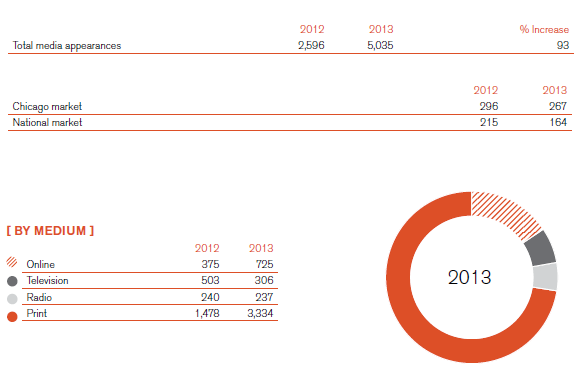 In 2013 we continued expanding our presence in news media, and were featured in more than 5,000 individual news stories. The Institute had breakthrough appearances in new markets and outlets, such as Neil Cavuto’s show on FOX Business, Chicago Public Radio station WBEZ, and in downstate radio and TV outlets. During 2013, the Illinois Policy Institute emerged as a digital leader in the think tank space with a nearly 500 percent increase in social media interactions compared to 2012, and our email list grew to nearly 150,000 subscribers. 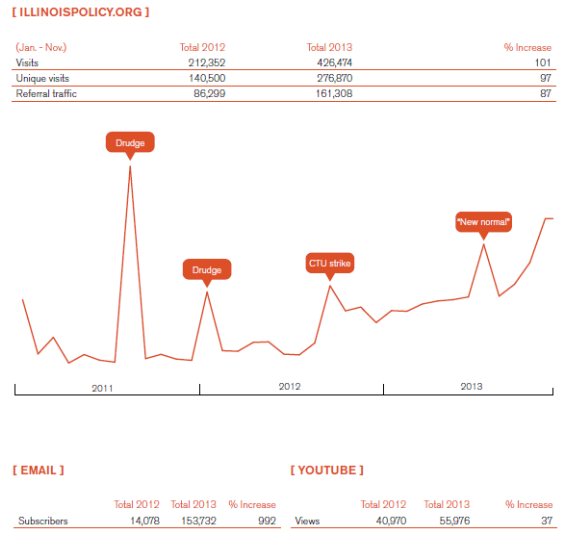 Our digital community is a force in Illinois and is positioned to shape the policy debate in 2014. The Illinois Policy Institute makes judicious use of its ability to advocate on behalf of taxpayers and entrepreneurs. Our frame of reference is very simple: If a policy promotes economic freedom, we support it. If a policy promotes government dependency, we oppose it. The Illinois Policy Institute’s government affairs team is now the largest and most impactful group of people working to advance the liberty viewpoint at the Statehouse. During the past year, the government affairs team monitored every piece of legislation introduced in the Illinois General Assembly. We met with lawmakers to discuss critical issues more than 1,000 times. At our urging, a group of bipartisan lawmakers introduced an expansive liberty agenda covering the issues of health care, education, labor, and budget and tax. We stifled attempts to pass a progressive income tax increase, stopped a state-based ObamaCare exchange, passed measures increasing government transparency and provided the only comprehensive budget solution to solve the state’s massive debt crisis. And 2014 will only see our impact grow as we continue advocating for limited government on behalf of taxpayers. From Jan. 22 to Feb. 2, the Illinois Policy Institute celebrated and promoted the ongoing success of the school choice movement by attending National School Choice Week events throughout Chicago. On March 12 the Illinois Policy Institute hosted Greg Glassman, founder and CEO of CrossFit, who shared his free market point of view and his business’ influence on the fitness community. On May 7, the Illinois Policy Institute brought together a panel of courageous leaders from Michigan, Indiana, Utah and Ohio who championed bold changes on school choice, pension and budget reforms, Right to Work and more. On May 20, the Illinois Policy Institute hosted Kansas Gov. Sam Brownback, who has aggressively taken on Kansas’ tax model – most notably by enacting the largest income tax cut in Kansas’ history and seeking, as part of a broader package of reforms, to reduce it even further. On June 25, the Illinois Policy Institute and the Union League Club of Chicago held the Chicago Digital Learning Symposium, a gathering of the who’s who in ed-tech excellence including teachers, education reform activists, policymakers, innovators and entrepreneurs gathered to hear from a world-class roster of speakers. On July 31, the Illinois Policy Institute celebrated Milton Friedman’s 101st birthday by highlighting one of his major priorities – school choice. On Aug. 5, the Illinois Policy Institute, in partnership with Reason, Chicago Young Republicans and America’s Future Foundation, hosted an evening with Kennedy, a former MTV VJ known for popularizing alternative bands such as Nirvana, at Sub 51 in Chicago, where she shared her experiences as a libertarian in the entertainment industry. The Illinois Policy Institute hosted a panel discussion on Sept. 18 with experts from Detroit and Chicago who discussed the economic factors and policies that led to Detroit’s bankruptcy, and what policymakers in Chicago and other cities can learn from the Motor City. The Illinois Policy Institute hosted its annual “Gifts of the free market” event on Dec. 10, celebrating the free market system and Founding Principles with the help of special guest Craig Zucker, creator of Buckyballs. 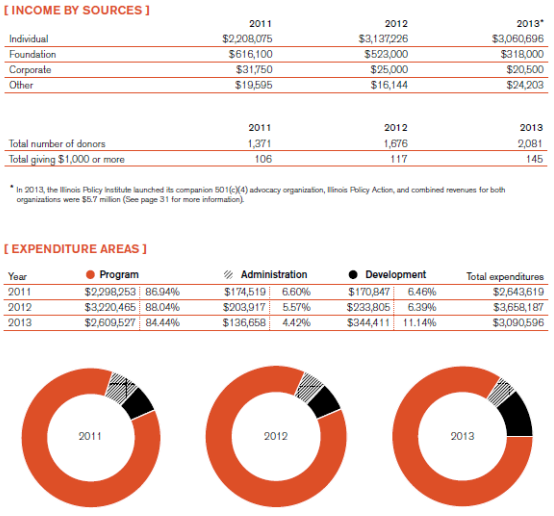 Looking at our fundraising numbers from 2013 – and looking ahead to 2014 – it’s hard to come to any other conclusion: we are: we are in the midst of an outpouring support for fundamental reform in Illinois. And we believe this groundswell of support means that people are betting on Illinois again. 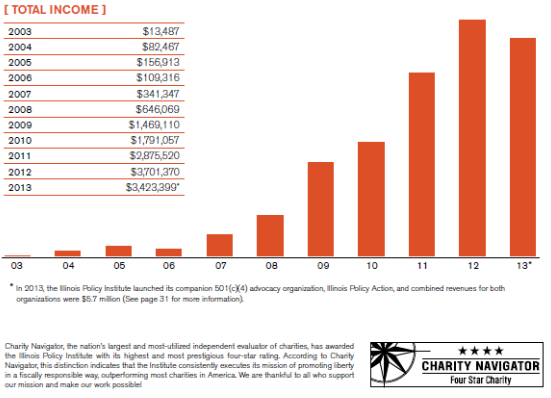 The Illinois Policy Institute saw more donors, more high-dollar donors and more growth than ever before in 2013. 2014 is a pivotal year for Illinois. The future of this great state is on the line. And we’re rising to meet the challenge. First, we’re refocusing our staff talent to build multidisciplinary teams that will be responsible for executing holistic marketing campaigns on key issues. This change will allow for a more dramatic penetration of liberty- inspired policy solutions with core audiences. On our agenda is stopping a progressive tax hike, passing real pension reform for state and local government, making the ground ripe for an alternative to ObamaCare and challenging the political power grip of government union bosses. Watch for us to open up local government through online transparency, promote school choice and offer solutions to rev up Illinois’ jobs climate. We’re also pleased to announce the launch of Illinois Policy Action, an advocacy entity dedicated to lobbying for the Institute’s liberty-based policy solutions. As a 501(c)(4) organization, Illinois Policy Action will engage government officials on the Institute’s vision for a freer, more prosperous society. This will help complete the vision of turning liberty principles into marketable policies that become law. We can change lives for the better because people like you make a personal decision to invest in liberty. As you watch 2014 unfold, ask yourself: What is a renewed Illinois worth to you? What will you give – in time or treasure – to make a difference? Illinois is counting on you.